Until recently, the adult neovasculature was thought to arise only through angiogenesis, the mechanism by which new blood vessels form from preexisting vessels through endothelial cell migration and proliferation. However, recent studies have provided evidence that postnatal neovasculature can also arise though vasculogenesis, a process by which endothelial progenitor cells are recruited and differentiate into mature endothelial cells to form new blood vessels. Evidence for the existence of endothelial progenitors has come from studies demonstrating the ability of bone marrow-derived cells to incorporate into adult vasculature. However, the exact nature of endothelial progenitor cells remains controversial. Because of the lack of definitive markers of endothelial progenitors, the in vivo contribution of progenitor cells to physiological and pathological neovascularization remains unclear. Early studies reported that endothelial progenitor cells actively integrate into the adult vasculature and are critical in the development of many types of vascular-dependent disorders such as neoplastic progression. Moreover, it has been suggested that endothelial progenitor cells can be used as a therapeutic strategy aimed at promoting vascular growth in a variety of ischemic diseases. However, increasing numbers of studies have reported no clear contribution of endothelial progenitors in physiological or pathological angiogenesis. 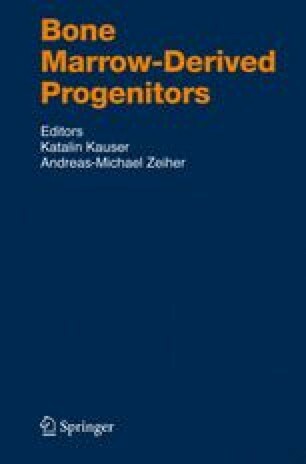 In this chapter, we discuss the origin of the endothelial progenitor cell in the embryo and adult, and we discuss the cell’s link to the primitive hematopoietic stem cell. We also review the potential significance of endothelial progenitor cells in the formation of a postnatal vascular network and discuss the factors that may account for the current lack of consensus of the scientific community on this important issue.